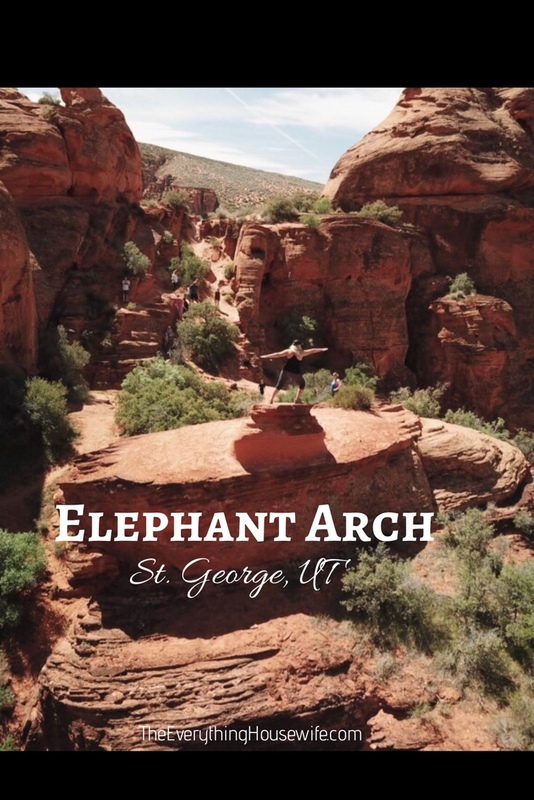 Just outside of Saint George, Utah is an amazing hike to Elephant Arch. It’s the perfect hike for family’s who have younger children! 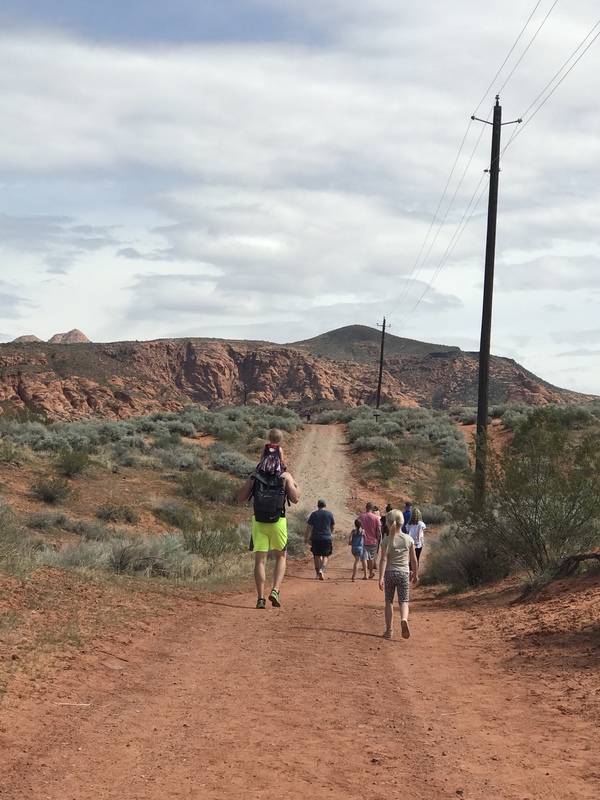 So you want to find something to do with the family in Saint George, and you are looking for a magnificent hike???? 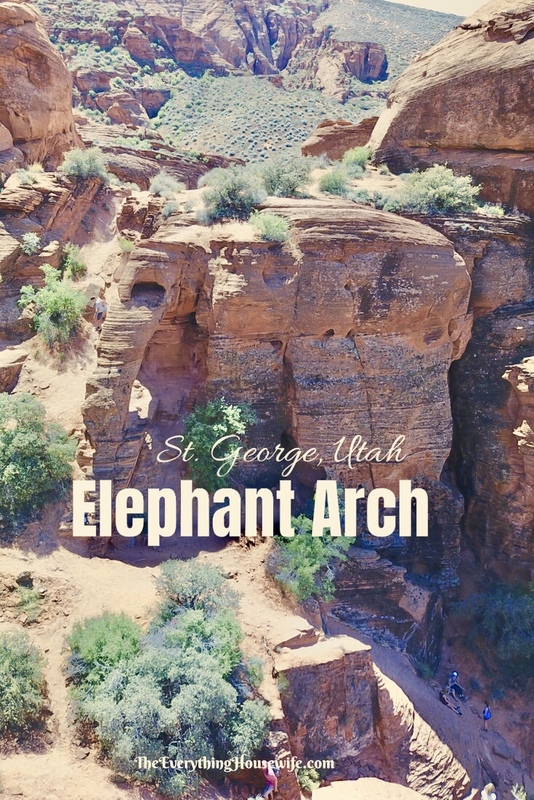 Look no further than Elephant Arch located just outside the city limits of St. George, Utah in the city of Washington. 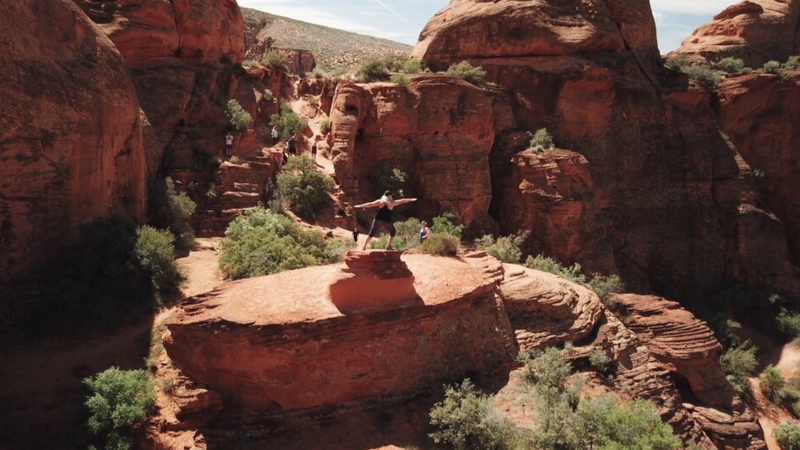 Elephant Arch is a beautiful hike perched along the red rock cliffs. 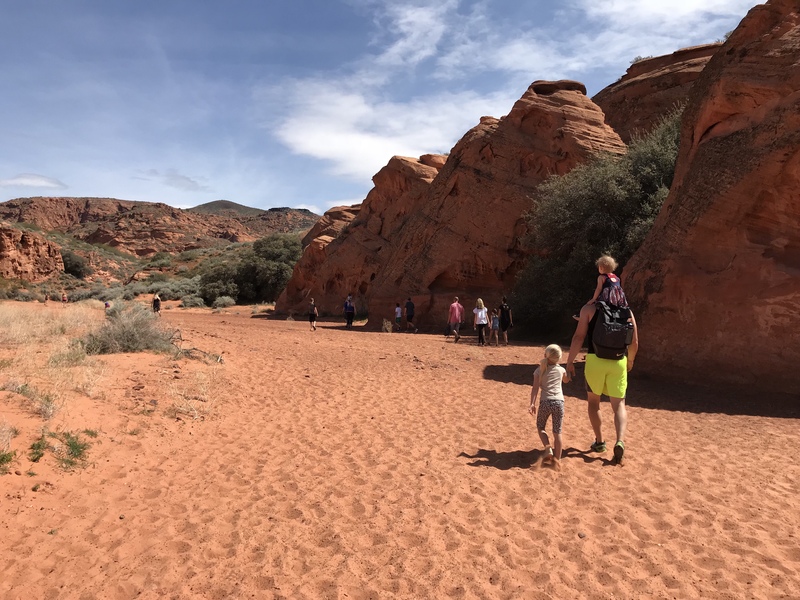 It’s a great hike for a family with small children! It took us about an 1 hour and 45 minutes round trip to complete the hike. However, please note that some websites indicate that this hike is “wheel chair” accessible–it absolutely is not. 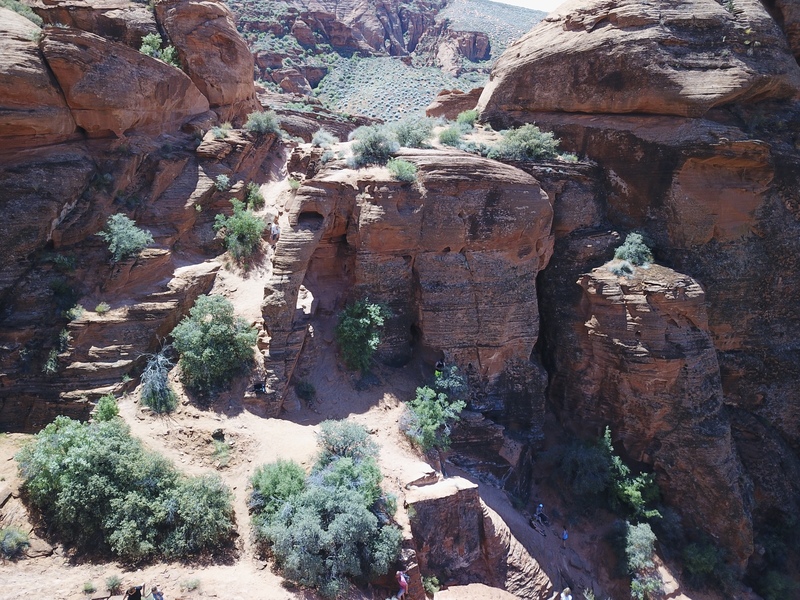 You will go up steep sandy hills as well as walk through stony, riverbed paths. Also, very small children will need help climbing “up to the arch” if you actually want to climb on the elephant. I opted not to take my toddler up there, but my 5 year old and 7 year old went up with other adults. 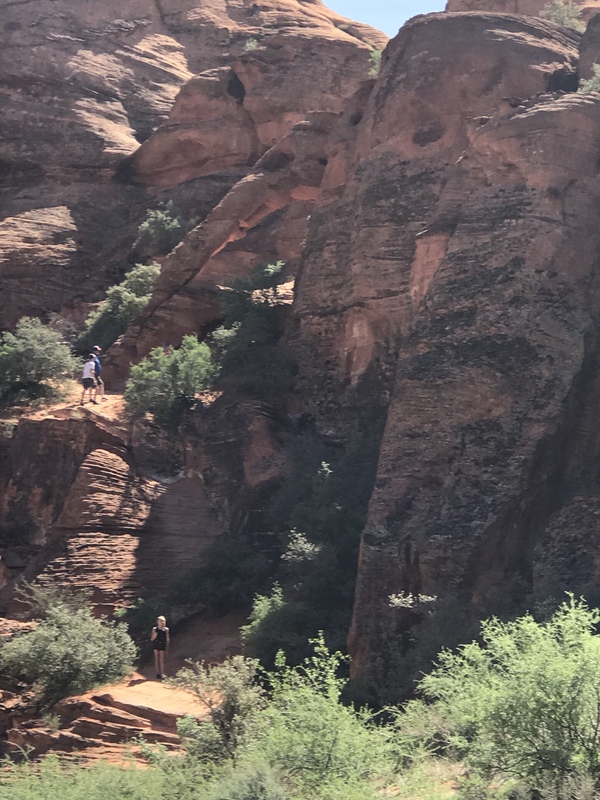 We began this hike on a sunny morning, and you will definitely want to hike this in the morning if it’s during the summer months, because St. George gets hot. Take lots of water, and wear shoes….wait, what kind of shoes you ask? 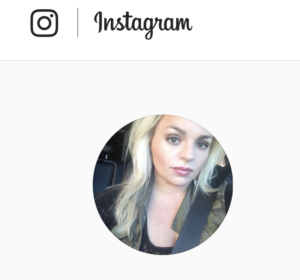 Well, that depends. In our hiking group, there was a variety. Some wore sturdy flip flops and others wore tennis shoes–so what should you wear? This is a very SANDY hike. There is sand everywhere. I removed my tennis shoes three times to dump out the sand. At one point, I took my tennis shoes off and walked barefoot, BUT this was in the earlier months of the year when the sand wasn’t that hot. Also, the tennis shoes I wore had netting across the top, and so that sand just drizzled down inside my shoe. So my recommendation is to wear ashoe that doesn’t have netting or holes. A sturdy hiking shoe is probably great, even a hiking sandal is fine IF AND ONLY IF it’s not roasting hot during the summer months. The sand would be too hot to walk on. 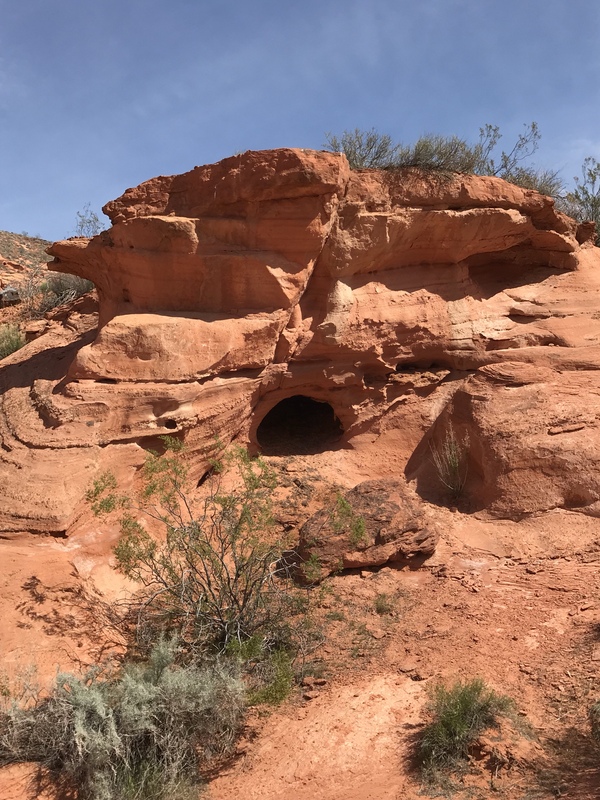 Now, for the legend behind elephant arch (the kids love this)……..
Once upon a time, up on Pine Valley Mountain (point to the mountain when you tell this part), there lived an old, scary witch! She was only scary because she looked like a witch, but really she was a good witch who loved Saint George and the mountain she lived on. It was early in the month of May, and this witch was becoming very worried because there was no spring rain for the newly planted crops. There seemed to be a never-ending drought. 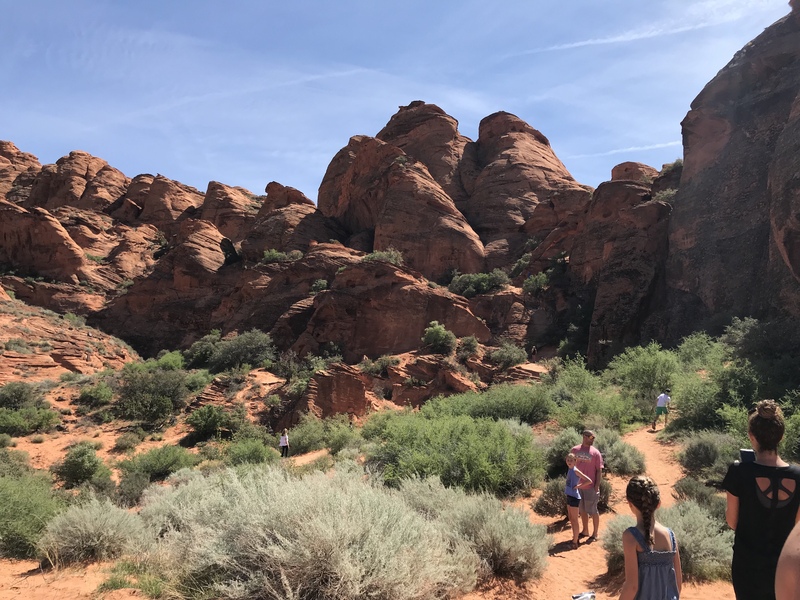 Down in the village of St. George, freshly planted seedlings were beginning to die and the riverbeds were filled with hot sand and dusty rocks. But because this witch was a good witch, she decided to do something about this drought. Near the Good Witch’s cavern, which was carved out the side of Pine valley mountain, lived a magical desert hawk–you may see hawks like this on your hike. The Good Witch asked the desert hawk if he would help her save the St. George villagers and their crops. She requested that the desert hawk carry a message to a Witch Doctor who lived in a faraway place called Africa. In Africa, the winds were dry and the lands were sandy, and the Witch Doctors there knew magical dances that could make rain fall from the sky. The desert hawk agreed to help the Good Witch because he too loved the St. George villagers. So, the desert hawk flew at the speed of a falling star toward Africa to find a Witch Doctor who would teach the Good Witch how to make rain fall from the sky. Early the next morning, as the desert sun was rising, a dusty twister began spiraling through the foothills of the mountain, and out of that twister stepped an African Witch Doctor riding a giant elephant with the magic hawk perched on his shoulder. It was the most magnificent scene. 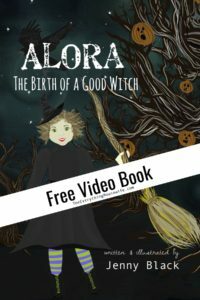 The African Witch Doctor greeted the Good Witch, and began his instructions for how to perform a rain dance. 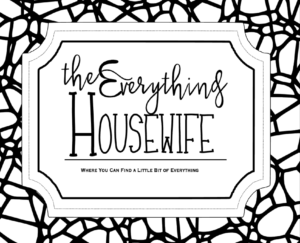 As a parting gift to the Good Witch, the African Witch Doctor left his magical elephant. The Good Witch thanked the African Witch Doctor for the elephant, and as soon as she spoke, the dusty twister reappeared and carried the Witch Doctor away. The Good Witch, with her new elephant companion, headed down pine valley mountain to find the closest river bed. When they arrived, the riverbed was so dry, that only desert sand and stones remained. Her heart sank, but she trusted the wisdom of the Witch Doctor. To prepare for the rain dance he taught her, the Good Witch gathered empty turtle shells and dried rattle snake tails. She held them high in the hair, and began rattling and shaking them back and forth. She moved her body back and forth, while she stomped her feet, kicking up dust all around her. She chanted and sang into the air, calling the rain to fall from the sky. Over and over the Good Witch chanted, and over and over she stomped her feet. For hours she danced until she had no strength left within her, and she finally collapsed on to the dusty river bed. The elephant, standing by, watched the Good Witch as she began to weep. Inspired by her persistence, that giant elephant gathered the rattle snake tails and turtle shells with his long snout and rose up on his two hind legs. The elephant began to dance. His heavy feet stomped the earth, and as he stomped, the ground began to shake beneath him. 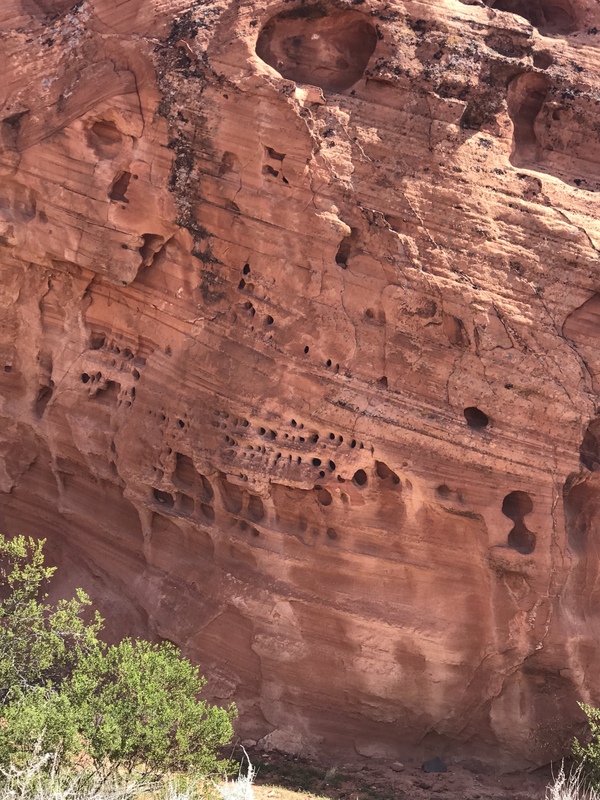 Dust filled the air, and rocks fell from the red cliffs. The river bed rocks began to rattle, and the earth beneath his feet shook for miles around. The rattling and shaking traveled all the way to the foot of Pine Valley Mountain, until the whole mountain of Pine Valley shook. The mountain shook so violently that the snow that sat all the way at the highest peak began to slide down it’s sides. As the snow slid down the sides of the mountain, it collected around the foothills until it finally reached the piping hot desert sands and melted into vast flowing streams. These streams of ice cold water from the Pine Valley Mountain tops filled the dry river bed, flowed through the valleys, and all the way down through the narrows filling the Virgin River to the brim. Not a drop of rain fell from the blue sunny sky, but that didn’t stop the water coming–and it kept coming until all the valley was watered. St. George was saved! 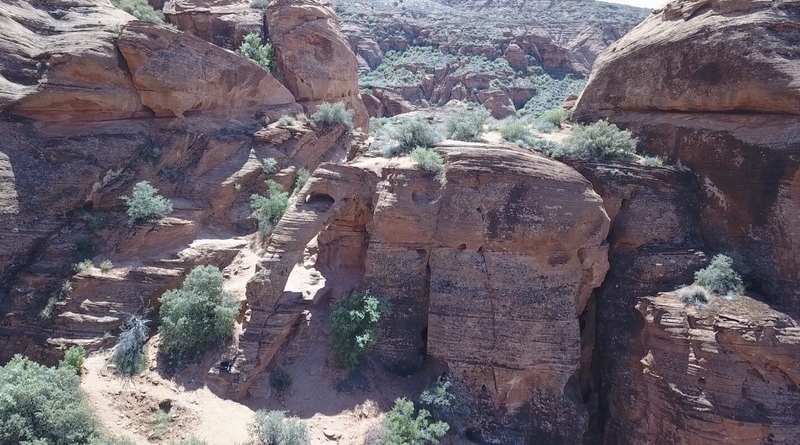 Now, when you travel through the dusty river beds, and down through the desert sands, you can find a beautifully carved elephant out of the side of a red rock mountain. Only, this elephant wasn’t carved by human hands. It was carved by magic on the very day that elephant danced for rain. As the earth shook, the rocks fell perfectly from the mountain side to leave an image of that elephant for all to see. Along the way, there are caves and beautiful rock formations. 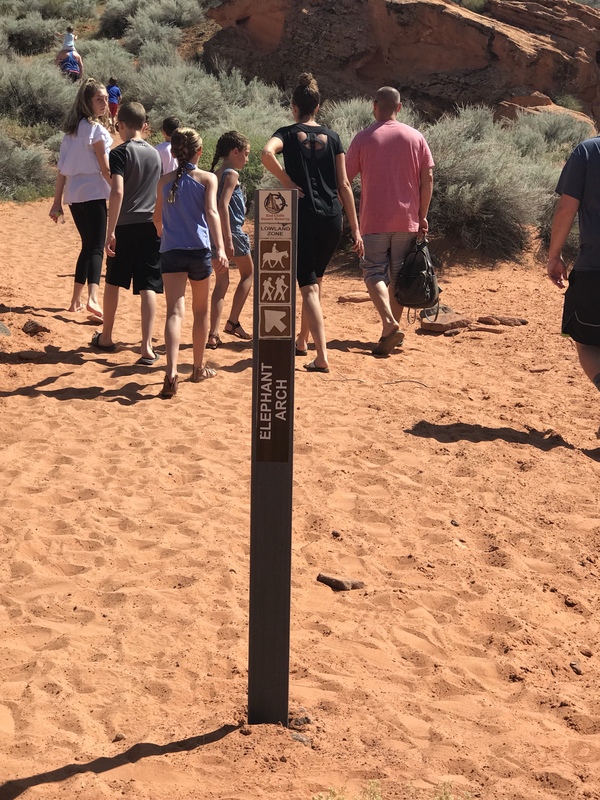 Watch for trail markers along the path! They will keep you headed in the right direction. Along the hike, watch for hawks and the desert tortoise. 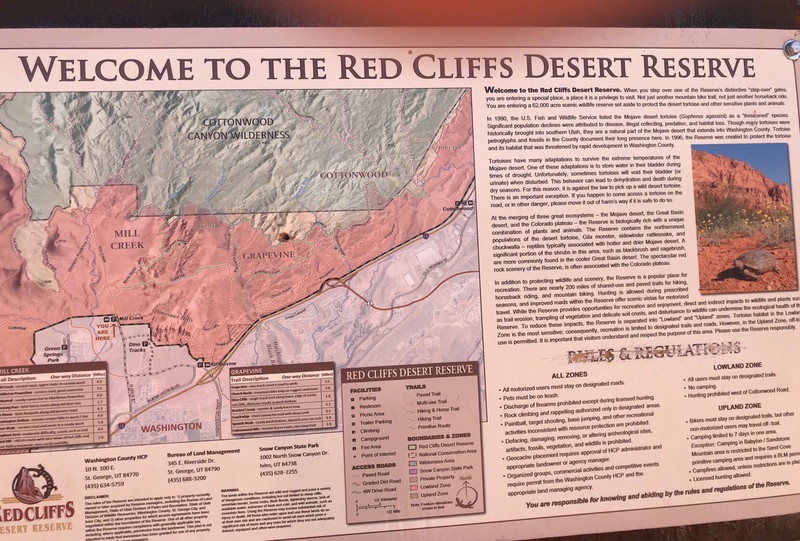 There is a desert tortoise reserve right here in this area. Also, this is the desert, keep an eye out for rattle snakes. If you see one, keep your distant. Usually they won’t bug you if you don’t bug them.